I hope your weekend is going beautifully! 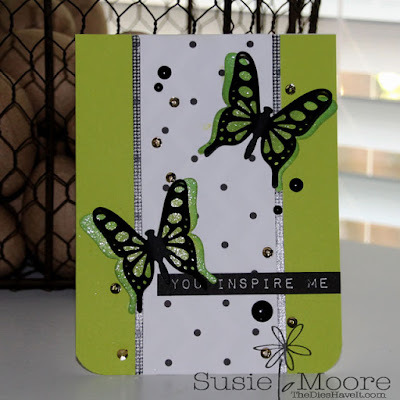 I thought I would make a simple card using some of last month's release from MFT Stamps. There are two butterfly die sets - one solid and one lacy and frilly. I colored the bottom layer and added some glitter to give some shine and then added on the top layer. I only attached it at the center so the wings could fold up a bit and I love the way it looks. I added some enamel dots and some gold sequins to finish the card.